Question:1.Why did the cricket began to complain? ? Answers: 1.1. The cricket began to complain when he found out at home that the cupboards were empty with no food and the winter was to come. Question:2.What did the cricket do in summer months ? Answers: 2. The cricket sang in the summer months. Question:3.Describe the condition of the cricket. ? Answers: 3. The condition of the cricket was that he didn't have a crumb, flower or a leaf to eat on the snow-covered ground . Question:4.Whom did the cricket ask for help? ? Answers: 4. The cricket asked a miserly ant for help. Question:5.What did the cricket tell her? ? Answers: 5. The cricket asked the ant whether he would provide him shelter from rain and a mouth full of grain. He also said that he would only borrow and would repay her tomorrow . Question:6.What does wicket mean? ? Answers: 6. Wicket means a small gate. Question:7. What does the word 'fable' mean? Answers: 7. Fable means a short story which has animals as characters and which conveys a moral to its readers. Question:8.Compare and contrast the character of the cricket and the ant ? Answers: 8. 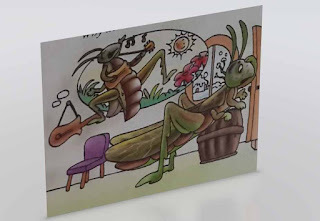 The cricket in the fable only sings all summer and does not collect any food which proves to be disadvantageous to him during winter whereas the ant is clever and collects food during summer so that he doesn't have to do any work during winter. a) Give the rhyming words in the above lines. b)Who couldn't find a crumb on the snow covered ground? c)What did he do then? d)What reply did he get? b) The cricket couldn't find a crumb on the snow-covered ground. c) He went to the ant for help. d) He got the reply from the ant that he should go and dance the winter away because he didn't do any work and sang all summer. You sang, Sir you say? a) When and why did the cricket sing?. b)What is the meaning of ' my heat was so light'? c)Who is the speaker of the last line? d)Which season is being referred to in the above lines? 2. a) The cricket sang during summer months because he was happy. b) 'My heart was so light' meant that the cricket was cheerful and carefree. c) The narrator of the story is the speaker of the last line. d) Summer season is being referred in the above lines.